The most important thing any parent should know about indoor netball for juniors is that it is a fun sport for children between the ages of 5 and 17. Children lose interest in sports when games are cancelled due to weather. Junior Indoor Netball keeps their interest because the weather has no effect on if the game is played. Teams consist of all girls, all boys, and mixed girl/boy teams. Indoor Junior Netball games have the same positions as any other netball game, with 7 players actively on the field. Each team must have at least 7 players, and can consist of over 10 players. Players get rotated out so every child gets their chance to be a part of the game, which means that Mum and Dad won’t be faced with unhappy children on the way home because they never got to play. It is easier for children to stay fit when they play Indoor Junior Netball. It helps children build skill and social development, learn rules and the importance of teamwork, and even young children enjoy the fun of being part of the game. Team-specific skills build as obstacles are conquered, reinforcing each child’s sense of community. 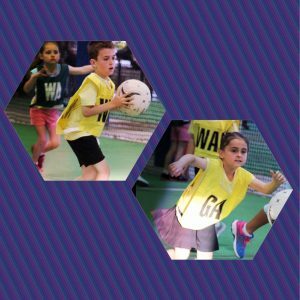 Help your child learn defence techniques and quick decision making skills by signing them up for a Junior Indoor Netball team at Indoor Sportz today. The teamwork and agility they learn will benefit them throughout their life, and they will have fun while learning. We supply umpires and a ball for every game at every age group, so all you have to do is find six mates who like to have fun while they exercise and come down.